It should be illegal for something to taste this good. Here’s a hint to all you readers (hello, anyone out there? Mom, is that you? ): if I post something the day I made it, then you know it was just so incredible that I needed to share it with the world right away. This was one of those meals – the type that makes you lean back in your chair and emit “oohhh” and “ahhh” sounds with every bite. Anyways, these burgers were unreal, and perfectly in sync with my current portobello mushroom phase. The recipe was inspired by the August issue of Canadian Living (which I managed to rescue from the piles of mail at my old house…I really need to get my address changed). As an aside, you can always tell which recipes I’ve made in books or magazines, since the page is absolutely destroyed with oil stains and food residue by the time I’m done. Oh the memories. Now, if you’ve been reading for awhile, you’ll notice that I frequently express my love for preparing certain foods. In the past, I’ve said I love slicing zucchini, peeling avocados and cutting bouncy eggplants, among many other equally as strange things. 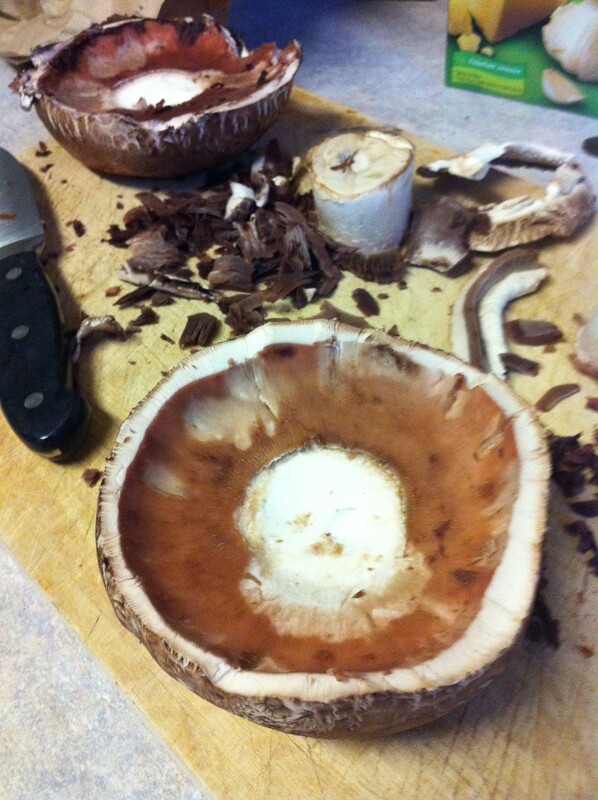 I can now add another neurotic food preparation love to that list: de-gilling a portobello mushroom cap. It really is a whole lot of fun (this may speak a lot to the type of life I have). You gently snap off the mushroom stem and use the side of a spoon to hull out the gills (you know, the fun underside of a mushroom that you always want to run your fingers against). Hey, don’t judge my strange obsessions. You don’t truly love food unless you love every part of it – gills included. There’s a life lesson for you, kids. PS: The broil feature on my oven has changed my life. It’s like a BBQ without the aesthetically-pleasing grill lines. PPS: The texture of a grilled portobello mushroom is what I imagine the skin of a dinosaur would feel/look like. Remove stems and gills from mushrooms; gently rinse caps under the tap and dry using paper towel. Brush mushrooms and onion with oil; sprinkle with salt and pepper. Place mushrooms, onion and red pepper on a baking pan lined with parchment paper. Put in oven that is set to its highest temperature – the broil/grill heat level. Let “grill” for 7 minutes, or until mushrooms start to darken and water is released. Meanwhile, make the red pepper mayonnaise. Remove the semi-roasted red peppers from the baking pan and add to a blender/Magic Bullet, pulsing with mayonnaise until combined. Scrape into dish. Once the mushrooms are cooked, remove pan from oven and place a slice of provolone cheese on top of each mushroom cap. Add halved buns to the baking pan and put back in the oven for another minute, or until cheese starts to melt and buns turn brown and crispy. Now assemble your burger: Put a generous layer of red pepper mayonnaise on the base of the bun. Add mixed greens, mushroom cap with cheese, red onion rings and another layer of mayonnaise. Try your very hardest to be ladylike while eating, but secretly enjoy the messiness. YES! I’m so glad you’re on the portobello bandwagon. Try marinating them in oil, balsamic garlic, and basil/oregano before you roast them next time. It’s magical. Oh my god, that sounds AMAZING, Carly! I might have to send you a message soon to pick up more of your vegetarian-friendly tips. Yes, definitely! Let me know if you need anything. I only wish I could have you over for dinner or something. My usual dinner companion is anti-mushroom. :) I will make them for you when you return home to me. Those burgers look great and I love Portobello mushrooms too! I didn’t realize you had to de-gill them. I just love your blog and your sense of humor! Thanks mom, I like it when you comment on my blog :) I didn’t realize you had to de-gill them either, but apparently it’s so that they don’t ooze a really nasty black water. You’re supposed to de-gill them when you use them in sauces too, so they don’t discolour whatever you’re making. I’ve been BBQ’ing portabellow mushrooms from time to time and you’re mexactly right- they sort of ooze the “black water” which you mention. They still go great on burgers though although I could see the water really making other stuff cooking nearby kind of icky…..
Hi dad, thanks for your comment – it’s been awhile! :) It wasn’t tough the stay cool…these only had to be in the oven on broil for a few minutes. It was the perfect fast summer meal. Next time I go home I want you to make these for me!